Concrete is a massively useful material suitable for a huge range of applications from foundations and paving, to walls and columns, to ceilings and arches. Gary Cooper and Sons can offer a wide range of concrete work from driveways to formwork, contact us for a discussion about your individual needs. Because concrete is poured as a liquid, it can be used to make any shape that is needed. This has been the defining characteristic of concrete since the Romans used it. From stairs and columns to simple patios or driveways. 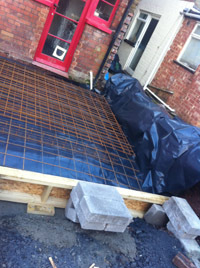 "Our aim is to provide you with the very best standard of advice and skills available for all groundwork solutions." Where formwork really comes into its own is in quickly creating strong walls. Using flat steel forms held in place with scaffolding we create a mould for the concrete and pour it in to this mould. To ensure that the wall created this way is strong enough for purpose, we actually pour the concrete around a mesh of thick steel wire to reinforce the structure. Aside from formwork, here at Gary Cooper and Sons we can offer a wide range of paving services, from decorative patios and garden paths, to a base slab for a garden shed.